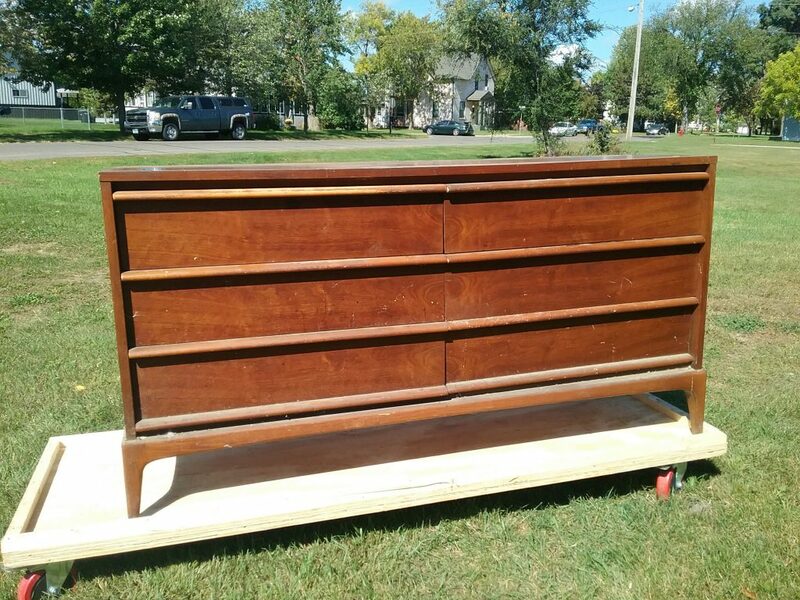 Lane Rhythm 6-drawer dresser, pre-restoration, September 2018. 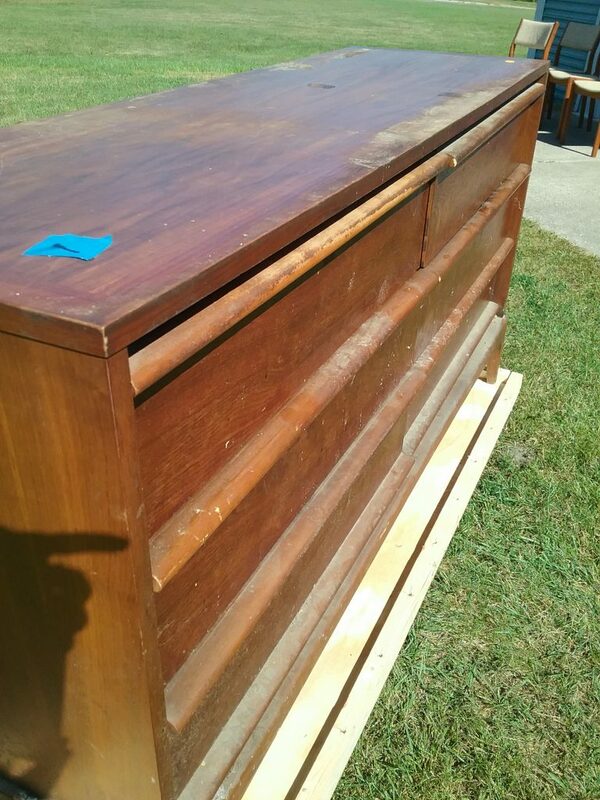 Back in September, we purchased a Lane Rhythm 6-drawer dresser that was in pretty tough shape with the intent to restore it. Here are a number of photos showing the damage to the piece. 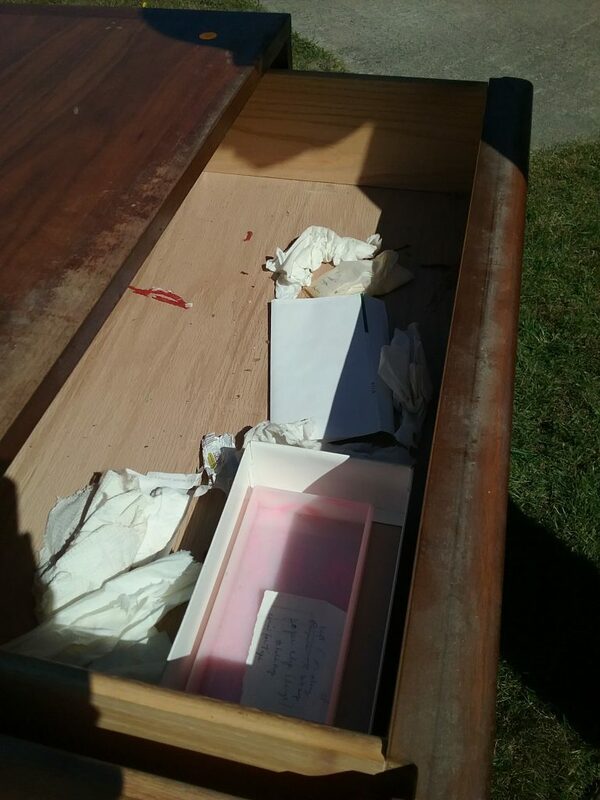 We keep waiting to find a wad of money forgotten behind the drawers of a dresser we rescue, but this dresser just had lots of random papers and plenty of mouse droppings. Not quite the treasure we were hoping for. Top of the Lane Rhythm dresser. Note the scratches and loss of finish. September 2018. 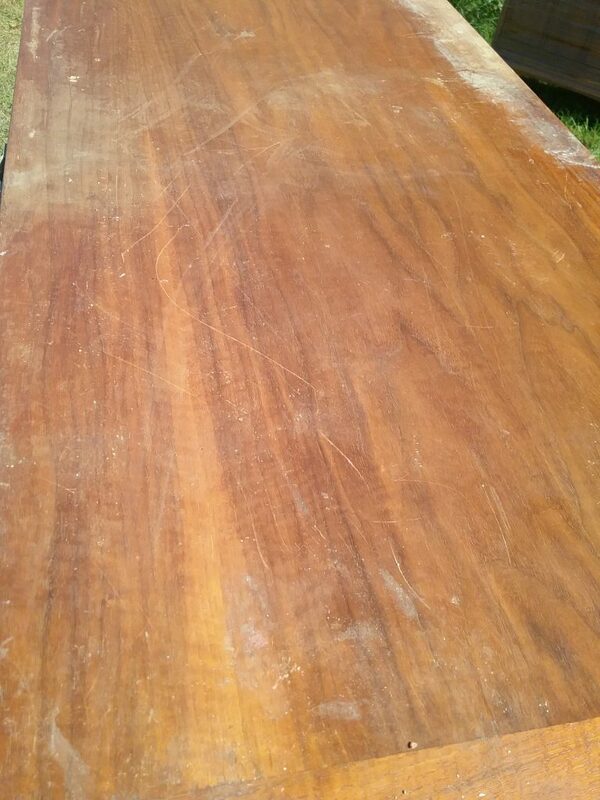 There’s a loss of finish on the front of the Lane Rhythm dresser, too. September 2018. Miscellaneous garbage left behind in the Lane Rhythm dresser. September 2018. 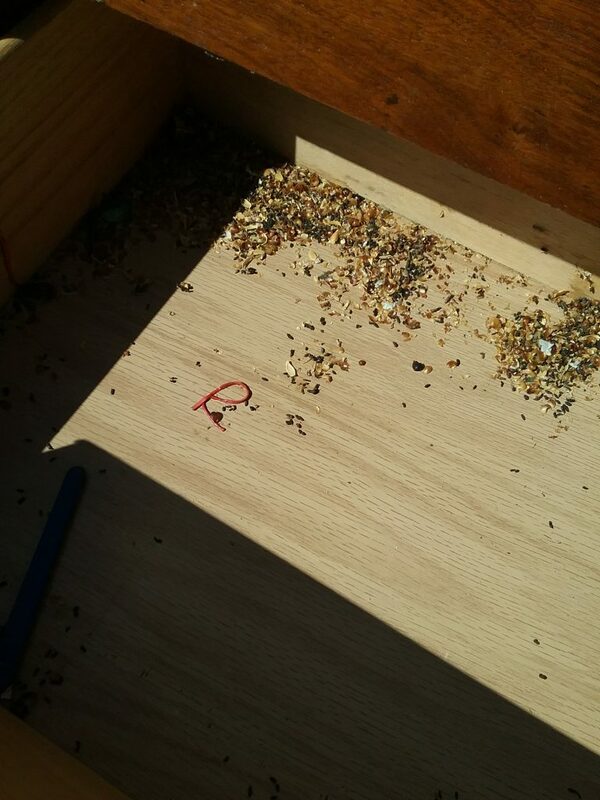 Mouse midden pile and droppings in the dresser. September 2018. As we cleaned the dresser, we wore gloves and masks due to the mouse droppings. 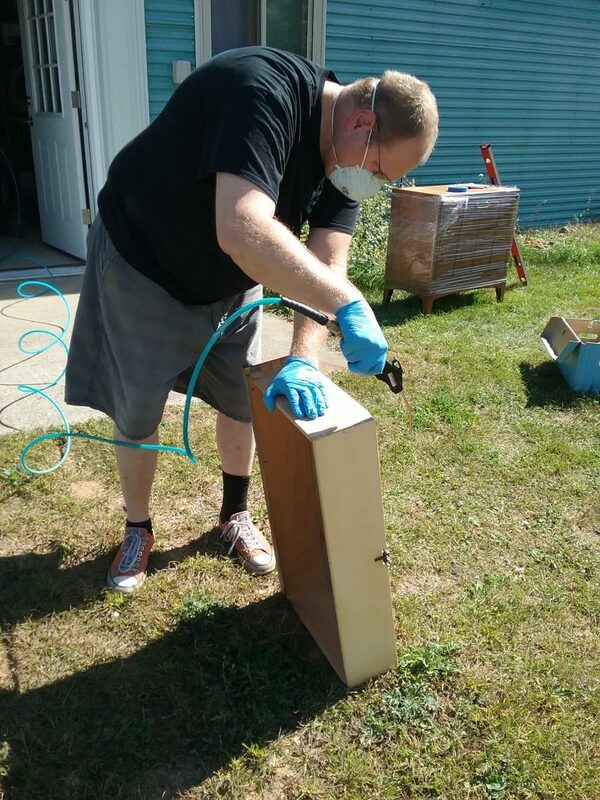 Here Erik is using compressed air to blow the detritus out of a drawer. September 2018. As we removed the drawers in order to clean the inside of the case, we numbered each one and its corresponding location using blue painter’s tape and a Sharpie marker. September 2018. 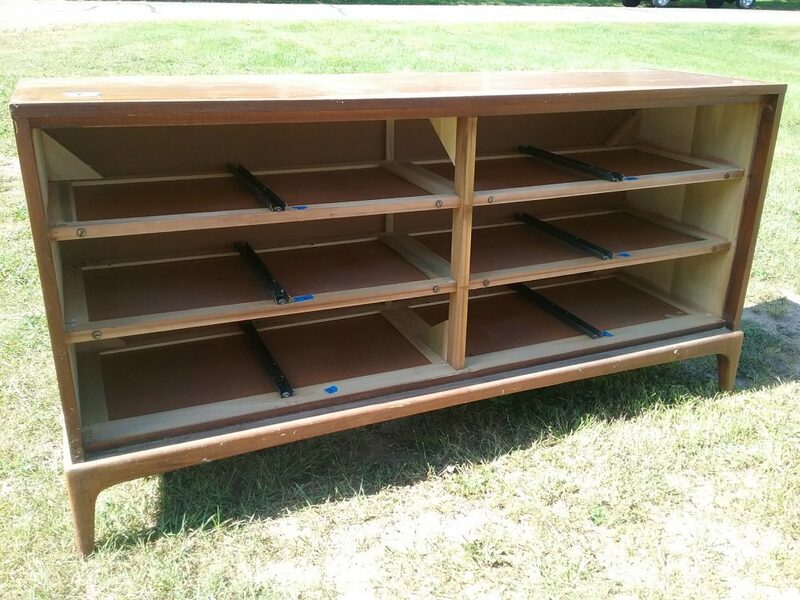 We have refinished a couple of other Lane Rhythm lowboy dressers in the past. 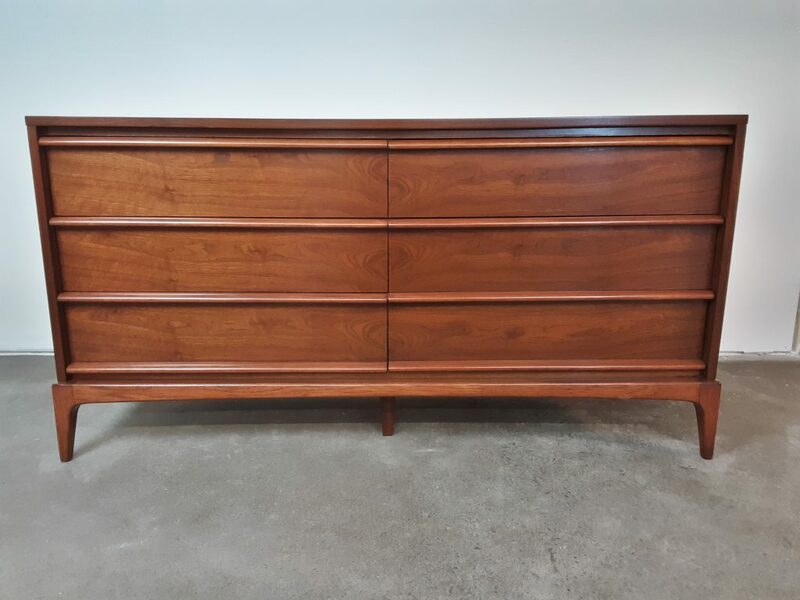 Each one has had the same design flaw – the dresser develops what we call a sway back. 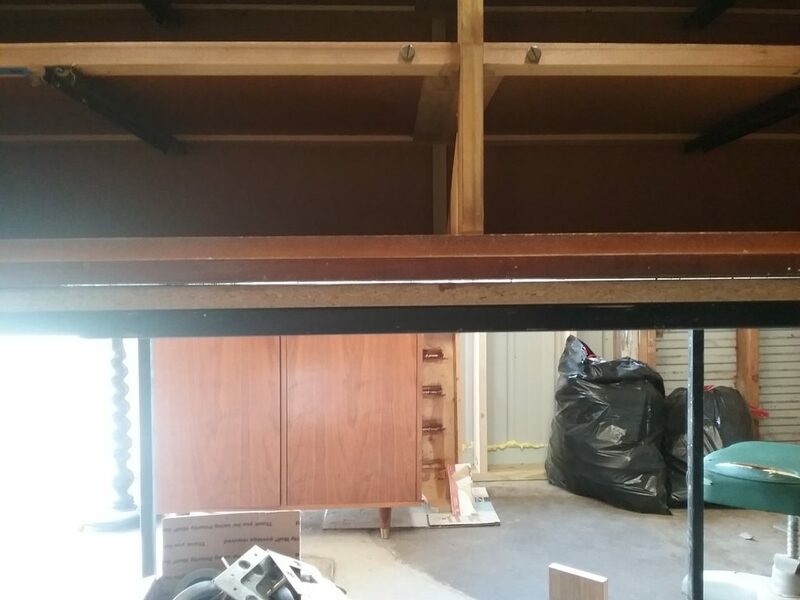 Due to the span and not enough support, the entire dresser droops in the center, so it is no longer level. September 2018. Here is the dresser case without drawers after cleaning. Large dressers are much easier to move with the drawers taken out. September 2018. 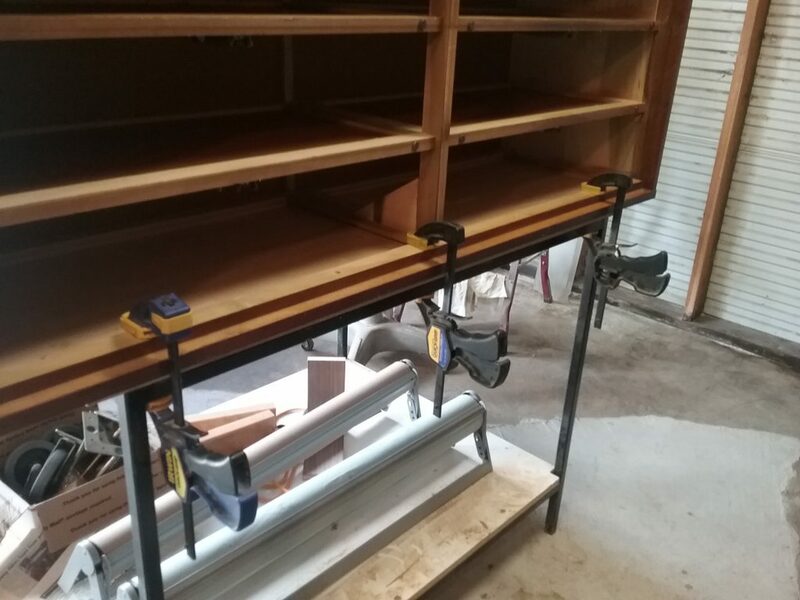 Once we got the dresser case into the shop, we put it on the work table with its top down. This allowed us to see the droop more clearly. See the white line beneath the dresser? 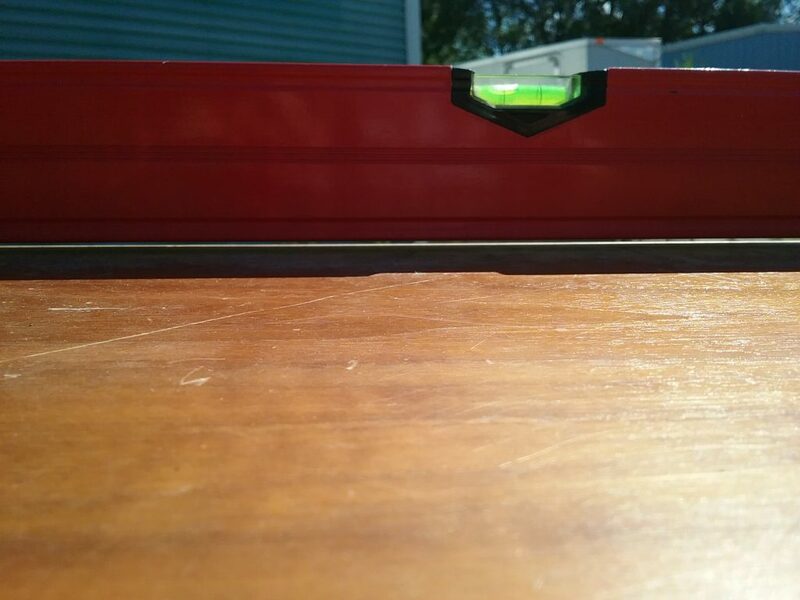 That’s light showing through indicating how the entire piece has sagged over time. September 2018. In order to try to fix the Lane Rhythm dresser droop, Erik first clamped it and attempted to attach a piece of angle iron to the bottom to pull the dresser into place. The hope was that the angle iron would both straighten the dresser and support it so it wouldn’t sag again. No such luck. The droop was so ingrained in the piece that when it was unclamped, the angle iron bent. September 2018. In order to make the refinishing process easier, Erik will disassemble furniture. Here is in removing the back. 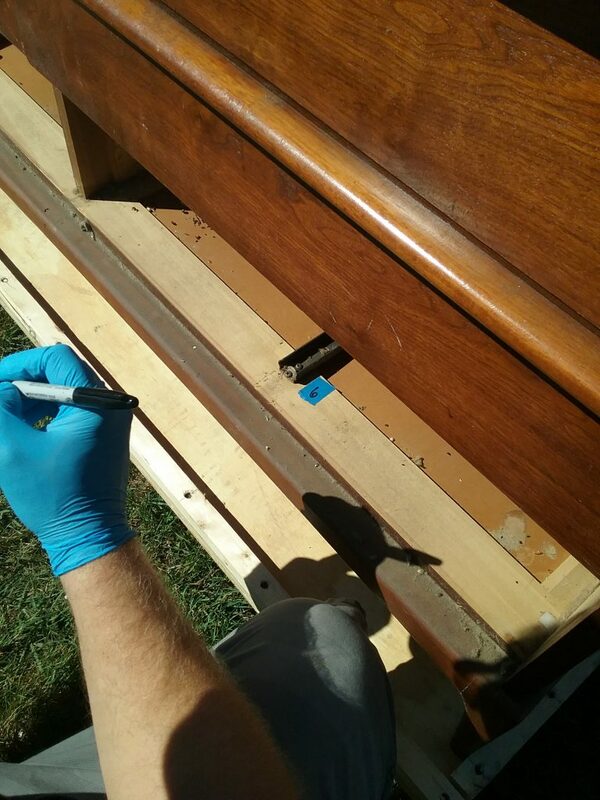 He also removed the top of the Lane Rhythm dresser and refinished it separately from the rest of the case. September 2018. Notice the wall framing in the above photo. 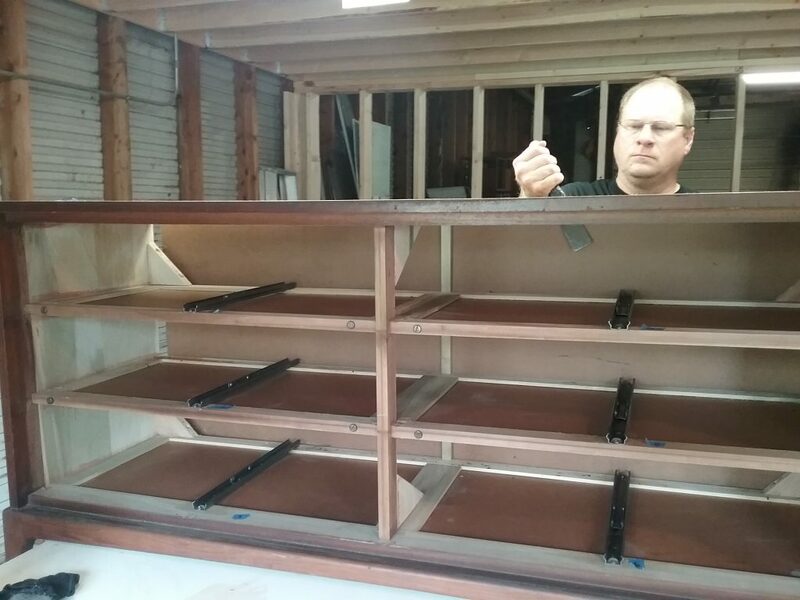 When we brought this dresser to the shop, we didn’t have our new shop space completed. As we let the Lane Rhythm dresser sit, we spent several months building out the shop. 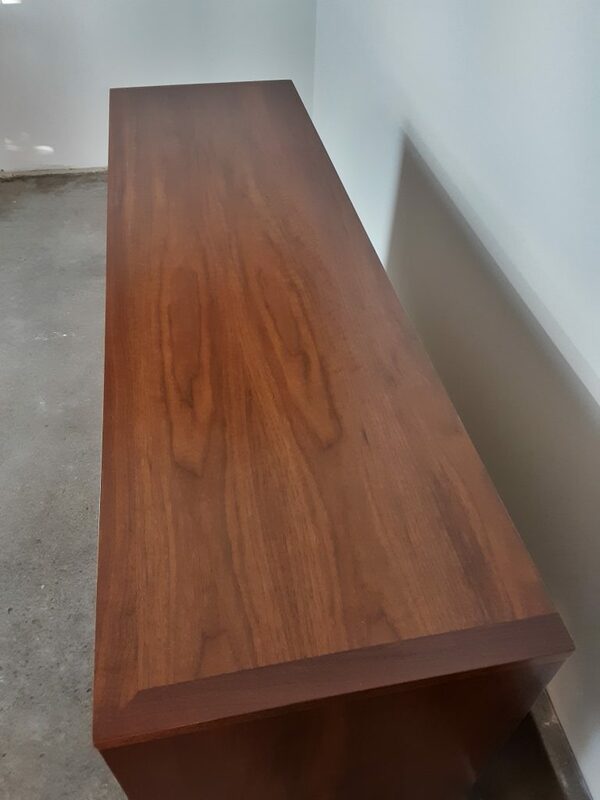 Once the shop was complete, we returned to the dresser this past week to finish it. Lane Rhythm dresser stripped, sanded, and awaiting stain. January 2019. 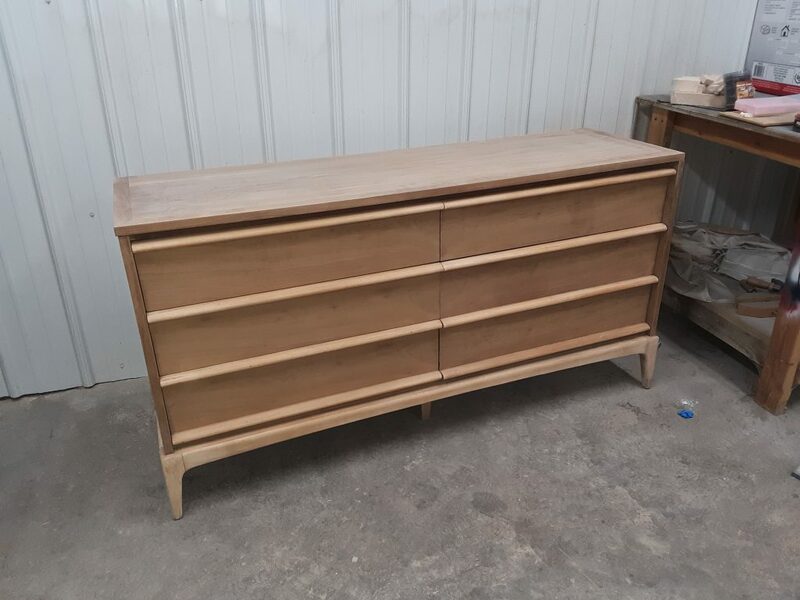 The finished Lane Rhythm 6-drawer dresser. See the extra leg in the bottom middle? That was Erik’s solution for the sway-back … add an extra leg to provide more support. See the wall behind the dresser? This was the same wall that was merely framing back in September. January 2019. Top of the newly refinished Lane dresser. It’s a far cry from what we started with, eh? January 2019. 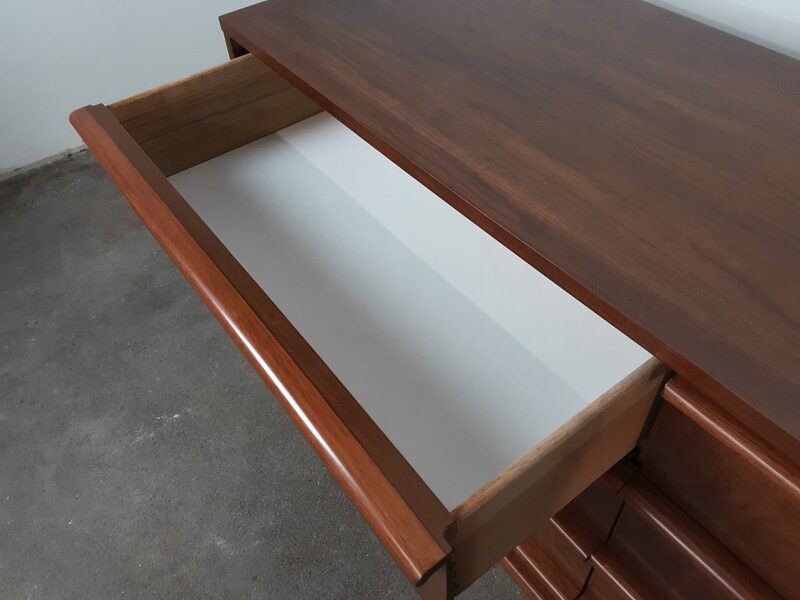 All the drawers were scrubbed to within an inch of their lives, plus we add new drawer liners. January 2019. One more photo of the front of the refinished Lane Rhythm dresser. We love the way this project turned out. January 2019. 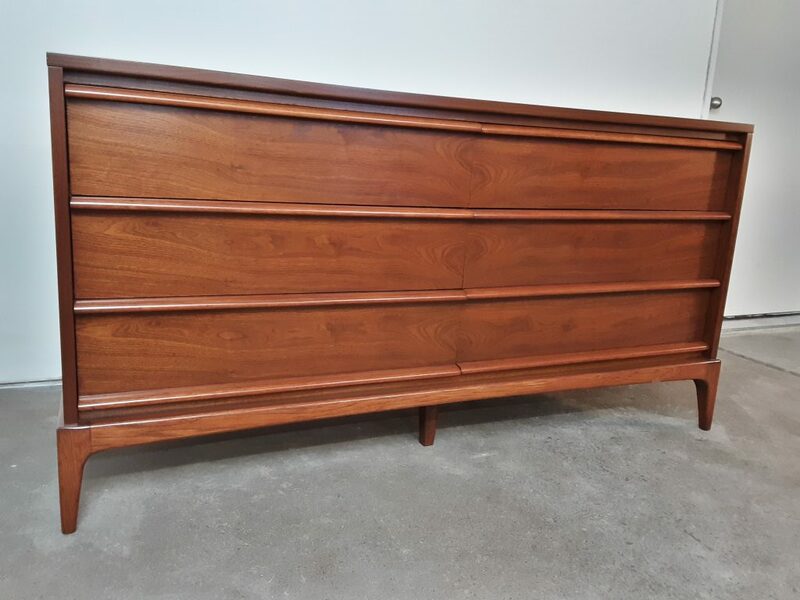 Measurements on the Lane Rhythm 6-drawer dresser, in case you’re wondering are: 61″ long, 31″ high, 18″ deep.